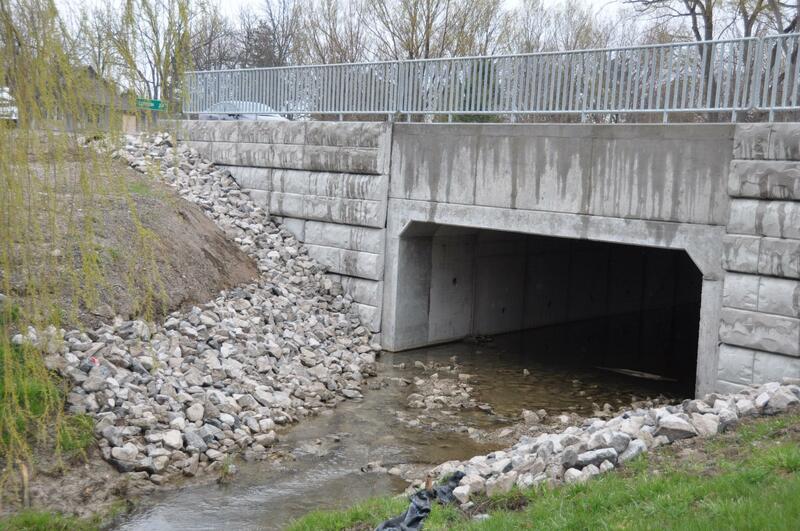 The creation of a new water outfall channel for the City of Hamilton adjacent to an existing channel required the installation of an engineered, precast retaining system that was low maintenance, strong, and had a natural feeling aesthetic appearance that would fit into the natural surroundings of the site. The project began with a site survey to layout the channel walls. The wall layout was difficult to complete due to the site-lines and the curving nature of the wall. The foundation base was cut, leveled and compacted for the base course layer per the engineered design requirements. Due to the nature of this site there was an engineer on site daily to monitor site conditions and the installation of the Retain-A-Rock. Reports were supplied to the client as requested. This site offered a variety of challenges including delivery of materials to the site, with limited space to off load transport trucks. The blocks had to be delivered to the job site, unloaded in the staging area and hauled one by one down into the channel and placed. The timeline to complete this project was also a challenge as all of the work had to be completed between November of 2014 and March of 2015 prior to any water flow beginning. Winter installation practices were put in place and followed by the General Contractor, Bronte Construction that complied with OPSS standards for the installation of the wall. During the installation it was discovered that the wall was located too close to an existing retaining pond and it had to be shifted to accommodate the existing pond. The wall was resurveyed, adjusted and as built shop drawings were supplied on completion for the City’s records. The 600 sq. 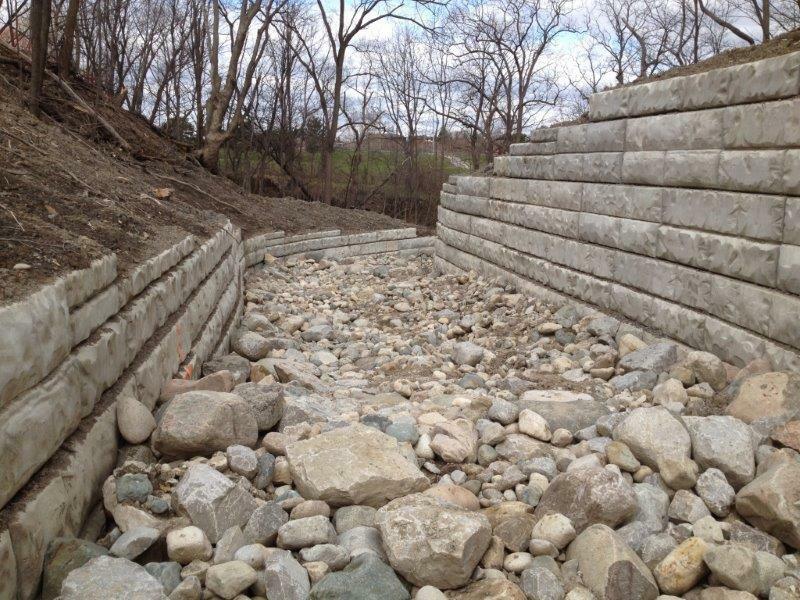 m. retaining wall outfall channel was installed with ease by the general contractor with the aide of a Design Concrete qualified Project Manager and completed on time prior to the expected spring water flow in March of 2015.